The "pick-and-shovel" play is based on a simple premise. When people are chasing shiny objects (like gold), you can join them and hope you end up with a big score. Or you can find something they need on their chase and watch the profits pour in. The term comes from the California Gold Rush of the mid-1800s, when prospectors were flocking to The Golden State looking for riches. Some of them succeeded and ended up wealthy beyond their wildest dreams. A lot more of them failed miserably. That was due in part to the knowledge and skills of the prospectors. But some of it also had to do with luck. It was a harsh and unforgiving environment, and not everyone made it to the right place at the right time. 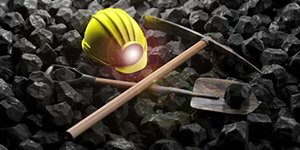 A more reliable source of wealth came from selling supplies to miners – such as picks and shovels. These were products that every miner needed, so the seller made money regardless of whether any one customer struck it rich. A pick-and-shovel play capitalizes on a major growth sector by investing in the products and services that supply it. Instead of trying to figure out which company is going to win the race to dominate a new field, you can sit back and bank steady profits while the various competitors battle it out. Today we have not one Gold Rush, but several. And instead of making a grueling wagon trip out West, you can invest in these pick-and-shovel plays without leaving your desk. Here are five of the top-growing sectors today, and our pick-and-shovel plays to deliver consistent and sizeable profits no matter which companies win out. One of the most reliable profit plays on legal marijuana comes not from a young startup, but from a $5.6 billion enterprise that began 150 years ago in Marysville, Ohio. That's Scotts Miracle-Gro Co. (NYSE: SMG), a leader in lawn care and gardening products and maker of the familiar "Roundup" brand of weed killer. SMG has made a big investment in the legal marijuana industry by diving into hydroponics. It's a plant-growing method that's been around for at least 400 years, but it has taken on new significance in the age of large-scale marijuana production. Because of its specific needs for light and dark, marijuana plants are most effectively grown indoors. Hydroponics makes this process easier by using nutrient-enriched water instead of soil. In 2014, Scotts created a subsidiary called the Hawthorne Gardening Co., which has managed the company's interests in hydroponic technology. Two years later, Hawthorne began the process of investing a half billion dollars into hydroponics acquisitions, including large stakes in indoor lighting producer Gavita and plant supplement producer American Agritech. Even without any further marijuana legalization on the way, this would have been a savvy move. Research & Markets projects the global hydroponics market to grow from $19.95 billion in 2015 to $27.33 billion in 2020. 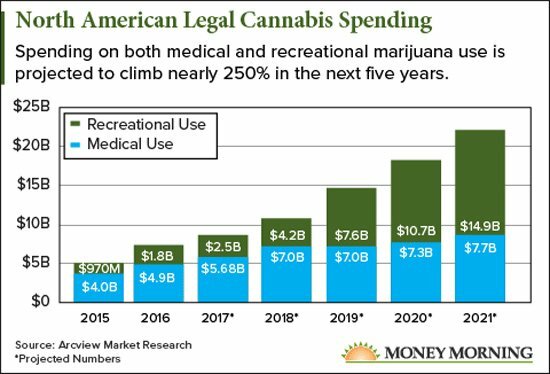 But with legal marijuana consumption set to explode in the coming years, Scotts Miracle-Gro provides investors with the safety and reliability of a Fortune 1000 company while also giving the opportunity to rake in cash from a burgeoning industry. "Scotts is the clear choice to anchor the low-risk end of the spectrum," Money Morning Director of Technology & Venture Capital Research Michael Robinson. "And its early move to embrace the cannabis community could help turn it into a robust grower." It wasn't that long ago that cryptocurrency was a niche that most traditional investors wouldn't touch. Today, it's featured regularly in The Wall Street Journal, and two highly respected U.S. exchanges have started listing Bitcoin futures. In November, The Financial Times called cryptocurrencies the "biggest speculative boom since the dot-com fever." Of course, the key word there is "speculative." No one really knows where Bitcoin or other cryptocurrencies are going from here. Even the idea that Bitcoin would be a reliable hedge against the traditional markets has proved untrue: When the stock market took a nosedive in early February, Bitcoin continued its plunge that began in December. It fell 63% below its December high before beginning a slow rebound. So it's understandable that some investors are wary of investing significant amounts in commodities that will make their hearts race on a daily basis. How didn't you trade when the markets are closed?